Ruellia growing herbaceous of the genus also known as Ruellias or Wild petunias, Ruellia perennial evergreen plant, used as ornamental groundcover plant and attract butterflies, can grow in subtropical, mediterranean, desert, temperate or tropic climate and growing in hardiness zone 9+. Leaves color green in linear to elliptic shape. Flower color purple, blue, white or pink in trumpet shape. 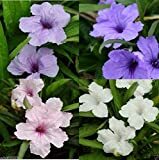 Mexican petunias Seed- Ruellia brittoniana 'Souther Star Mix' 30 Seeds!